Singapore’s Committee for Private Education released the results of its Private Education Institution (PEI) Graduate Employment Survey (GES) on 15 November, finding that the overall employment rate of fresh graduates from PEIs six months after their final examinations was 84.3%, including full-time, part-time, freelance, and contract work. Surveying students from 40 PEIs, the survey was conducted in partnership with SkillsFuture Singapore, where 32% of the 11,003 graduates invited shared responses. Taking into account just full-time permanent employment, the employment rate was 60.1%. In comparison, the corresponding figures for autonomous universities (AU – NUS, NTU, SMU, SUTD, SIT) were 89.6% and 79.9% respectively. 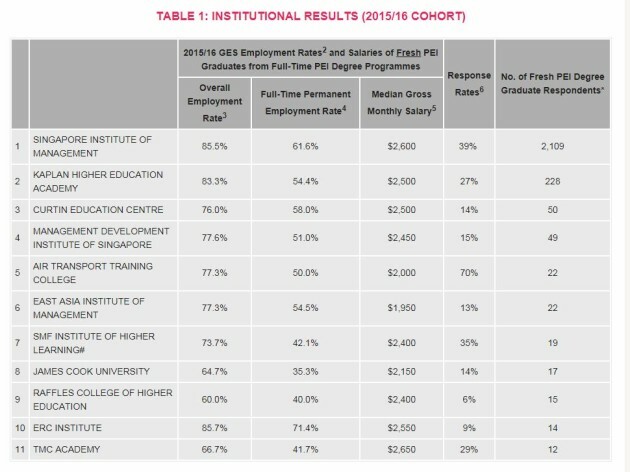 The survey also showed that the median gross monthly salary of the graduates from PEIs in full-time permanent employment was S$2,550, compared to that of fresh AU graduates at S$3,325, and that of fresh and post-National Service polytechnic graduates at S$2,180 and S$2,517 respectively. Further, there are PEIs with less than 10 fresh graduate respondents, either due to small enrolment or low response rate. While their results are not reported, the PEIs are listed below. From ancestor worshiping to delighting in auspicious foods, here are some of the traditions to look forward to this Lunar New Year..